14 Law Enforcement Technology January 2016 www.officer.com The pioneers Role models are essential in promoting a particular career, and the more women who get on tactical teams, the more role models there will be for others who want to follow the same route. "Women in general are changing – it's the issue of empowerment and role models more than anything," says Lou Ann Hamblin, Mass., CEO, Louka Tactical Training. "Women in our industry don't see these role models. This limits the vision of young, aspiring female police officers. Unless they know these roles models personally, they don't know these women exist. You are only a role model if people can see you. 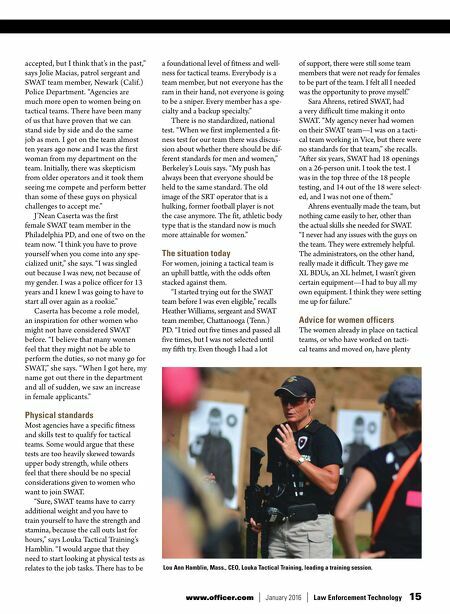 COVER STORY T he fact is that women are still underrepresented in law enforcement (between 10 – 20 percent of the force, ac- cording to expert estimates), and some departments have no women at all on their tactical SWAT units. This, however, is slowly changing as law enforcement in general begins to see beyond gender and evaluate tactical team members as individuals. Some tactical units have had female members for decades, while many oth- ers still have none. It's rare enough that stories are still done in the mainstream media about the first female member of a particular tactical team. Role modeling is particularly important at this critical stage." Jennifer A. Louis, lieutenant, Berkeley PD Special Response Team, emphasizes how important it was that women had been successful before her. "Our SRT team has been in place since 1976 and our first woman was on the team in 1988," she says. "Knowing it was possible was key. It's up to each one of us to do the best we can do in the position we are in, and we have to reach a hand down to help those who are coming after us. We have to be better, to move farther and to open new doors." The times certainly are a'changing. " 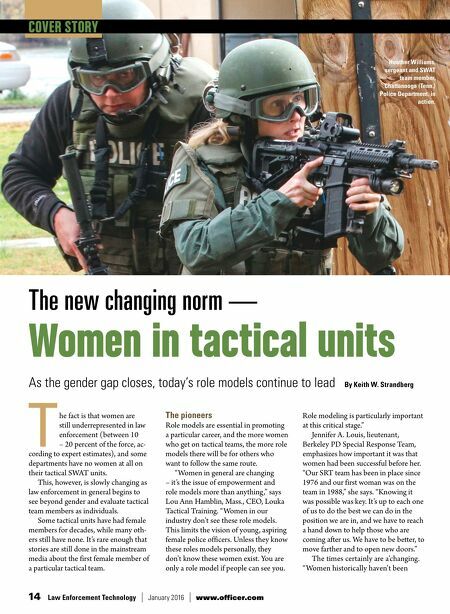 Women historically haven't been The new changing norm — Women in tactical units As the gender gap closes, today's role models continue to lead By Keith W. Strandberg Heather Williams, sergeant and SWAT team member, Chattanooga (Tenn.) Police Department, in action.